So because of this post from last week I am now writing this post. I was showering away last night after everyone had already gone to bed. Because well that's when mom's shower you know. You stink all day and do all your work and then you shower at night when it is dark and quiet. So I am exfoliating my face and I hear a noise, just a quiet bump in the night. You know those sounds you always hear at night and never check them out. But I didn't pay any attention after all there are four other people here all sleeping right. So my eyes are closed I am exfoliating like I said then... wait you need to know one detail: my shower door is clear glass.... I opened my eyes and nearly jumped out of my skin. And then I realized, it was just me. Yep... I scared myself. Got my heart rate up and everything. Everyone else was just sleeping away and I was in the shower scaring myself. Didn't realize I was so jumpy. 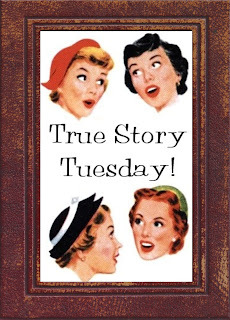 So after I scared myself I proceeded to write this post in my head for a True Story Tuesday. If you have a story and are all about public humiliation like I am then link up over at Once Upon a Miracle.